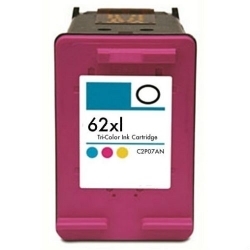 Our high-quality and low prices for Remanufactured Hewlett Packard C2P07AN / HP 62XL High Yield Color Ink Cartridge will save you money with every print. Our C2P07AN cartridges are guaranteed to work in your Hewlett Packard printer. Our high-quality compatible Hewlett Packard cartridges are fully guaranteed and environmentally friendly, giving you the best print quality every time. We have the lowest price on compatible and remanufactured Hewlett Packard ink cartridges and toner cartridges.